A food distributor is much more than just the means to a well-stocked shelf. A food distributor offers many benefits to both the purchaser and the supplier. One of the primary functions of a food distributor is the capabilities to transport products from suppliers to food service operators. Large scale transportation cuts down the cost of moving the goods. Interra International offers ocean transport and nationwide trucking services for land transport, including specialized chilled and frozen containers. Proprietary tracking systems provide a unique value to food service operators. Knowing where your food shipment is at any moment, that it is being properly handled, insured if applicable, and on schedule for delivery is important for seamless day-to-day operations. Our talented and experienced staff provide smooth transition from ocean to land transport, especially temperature sensitive items. Growers and producers can focus on their core competency and let their food distributors handle marketing and sales. Distributors also offer banding and marketing options for purchasers, which can be a huge value add for some food service companies. 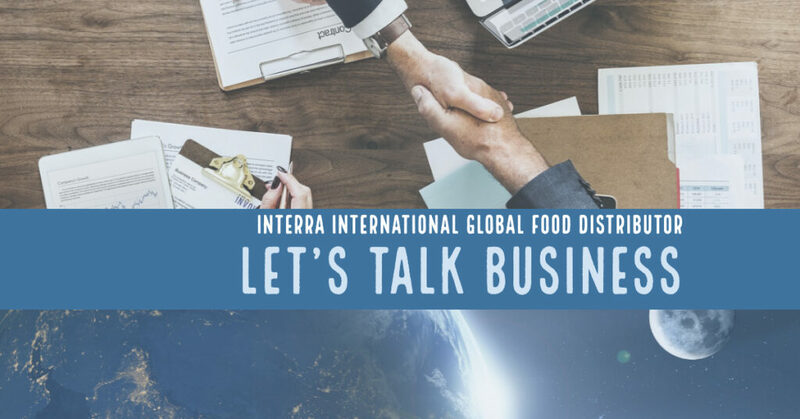 Interra International is a specialty food distributor focusing on Proteins, Commodities, and Feed Ingredients. From poultry, pork, and beef to dairy, sugar, rice, nuts, oils, and tomato products, we can help you find the right source at the right price! Learn more about us or call today for more information +1 770-612-8101.